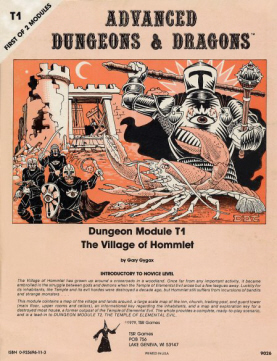 Update: D&D Classics.com now sells the adventures T1, T1-4, and Return to the Temple of Elemental Evil in pdf form. Greetings from afar, as I am drafting this in Scandinavia on breaks in my family vacation. The world is a wonderful place! 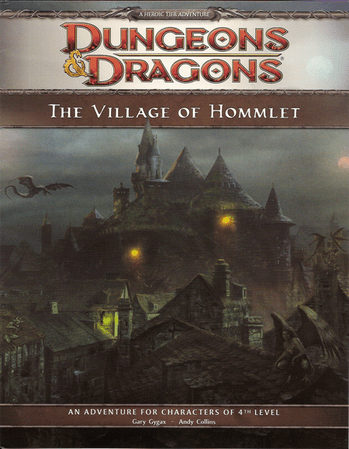 This blog entry shares how our group has converted Temple of Elemental Evil for use in D&D Next. In particular, I want to share how Fiasco was used to create PC relationships so the players had greater interest in the narrative. 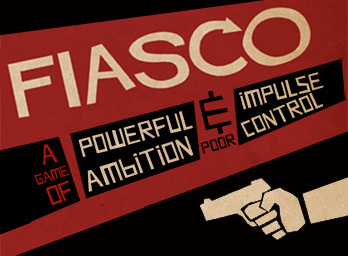 Fiasco is a really fun story and RP heavy game made by BullyPulpit. You work collaboratively to set up the game, selecting short statements from tables that help establish relationships between players. Players then take turns setting up or finishing scenes based on those relationships (Geek & Sundry has video of an actual game). We can borrow these ideas to create a richer experience for players. This is especially useful if you want to jazz up Caves of Chaos or another classic adventure lacking sufficient PC motivation. A great way to do this is to flip through the various playsets and select relationships the players might enjoy. Then hand them out to players. On the Fiasco site and on DrivethruRPG you can find several free playsets, including a fantasy themed one (Dragon Slayers, available here) by Logan Bonner. With a bit more work you can link them to the story. That’s what I did with Temple of Elemental Evil. We had playtested ToEE with one judge for D&D Next, then continued with our 13th Age playtest. 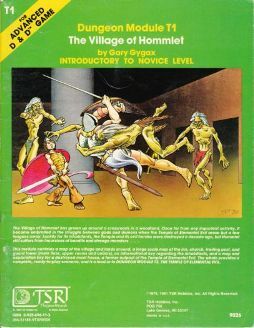 A few weeks later it was time for me to judge with D&D Next. Relationships were a good way to keep player interest high. You can also check out Sly Flourish’s blog entries here and here on his use of Fiasco-styled relationships. The first one presents specific ideas you can use with Caves of Chaos. 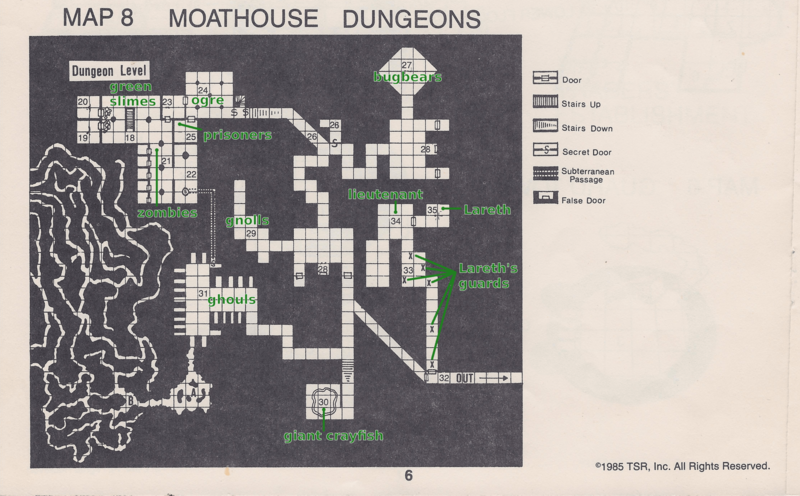 We were resuming on the bottom level of the Moathouse, just after room 27 on the map, having defeated the bugbears. I spent about 20 minutes finding monster replacements for the level, using the Caves of Chaos adventure in the first playtest for guidance. I’m a decent improvisational DM, so here are my very basic notes. I planned on just winging how I would create RP possibilities. The room numbers are all from the original map found in ToEE. Room 31: 1 medusa. Add door to the first area of caves. Run as in CoC, with her in area A of Moathouse map. Can retreat to B if necessary, with tunnels interconnecting. She tries to hide her nature, convince PCs to come in and open door that keeps her within. Uses tunnels to her advantage. Room 32: Use seductive shapes from 58 of CoC. If triggered by 3 persons, bell rings (warning those beyond) and 3 skeletons appear magically. Room 33: 3 skeletons in hallway, 2 dark acolytes and 1 dark adept in 33 itself. Use treasure from CoC 56. Lareth will also come if combat begins. Room 34: run as room 55 in CoC, no creatures. Room 35: Lareth, run as Dark Priest. Run as room 59 for treasure. If Lareth is bloodied, offers information in exchange for life. Willing to give up allies, such as Rannos. See Writing Desk on p. 20 of 4E RPGA reward version. Also, books contain info from page 27 of ToEE. I took Logan’s Dragon Slayers and also the Fiasco book and picked some fun relationships. For typical players I would go with positive relationships. For my group I knew they could handle a bit of tension without derailing things. I chose a few conflicts and wove them into the story and into the PC backgrounds and themes. What you see below is my handout, which I cut up and handed to each player privately. With a little work you can use these for any adventure. You worship Pelor, the god of the sun. Pelor is good and benevolent, his light burning away sickness and impurity. You follow the path of healing, unlike the Dwarven Cleric, a follower of Moradin. Moradin is a war god, responsible for much bloodshed. Long have you and the dwarven cleric argued over this, and you fear his brash attitude could get the party into trouble. Though you respect all of your companions, you welcome any chance to point out your faith’s benefits and the benefits of being a strong healer. You took the path of healer in part because you believe in redemption. Though none know it, you were once less than honorable. A priest of Pelor believed in you, giving you a second chance and securing your freedom from jail. You do like recognition. It would be nice if the others realized the role you play. Perhaps once the fighting starts they will see how important a healer can be. The High Elf wizard bears watching. You have heard that wizards are often tempted by power and artifacts. You wonder if the High Elf could be converted to the path ofPelor. It might save his soul. You worship Moradin, the soulforger, who created dwarven kind under the mountains from the very rock itself. Moradin has made you strong. Your faith, unlike that of the weak goody-two-shoes human Pelorite cleric, has made you a strong warrior. When faced with danger you seldom back down. With every downed foe you illustrate Moradin’s glory, and you relish showing the human cleric your capabilities. You are a knight, and your knightly order has charged you with an important task before you can be promoted: the destruction of four relics of evil. You hope to find them within the Moathouse and crush them with your warhammer! One thing is sure, no one is performing any evil rituals on your watch! One problem is the high elf wizard. You two adventured together previously, and through an unexpected turn of events he ended up saving your life. You are supposed to be the strong one, and the no-good elf keeps bringing it up.You like being the hero and defending the little guys. It rubs you the wrong way when the elf mentions having saved you. You’ve even contemplated letting the leaf-eater get in over his head, just so you can save him and even the score. You have heard tales of the Temple of Elemental Evil. It is said it was a threat to all in the region, including the Elven kingdom of Celene. It is also said that the forces of the Temple held great magics and lore – recovering this could allow you to become a great wizard, and you have always yearned to be recognized by your elven peers. You seek the ancient lore and powerful relics that could be used in spells and rituals. Bringing these back would greatly elevate your standing in the elven lands. You know the Mountain Dwarf Cleric well, for you adventured together before. You once rescued the dwarf from certain peril, and this angers the dwarf greatly. You cannot help but enjoy mentioning it from time to time. The human cleric of Pelor is a kind fellow. One of the more likable members of the group. You wonder if he could be the glue that holds the group together. Well, so long as he doesn’t take issue with your research. You told your old adventuring group that any good adventuring party needs a rogue. You regret that, because the Halfling rogue set off a trap… you ended up captured by an evil priest named Lareth the Beautiful. Your companions were slain, but Lareth decided to amuse himself. He placed a curse upon you and the rogue – if either of you are separated by more than 50 feet, you each begin to bleed until you come closer (1 HP/round). It isn’t a pretty sight, either! You and the rogue have found that to reverse the curse you must find the exact two goblets Lareth used in his ritual, mix some of your blood into each, and drink it. Horrible, but the sage swore it would work. The sage’s divination claims the goblets are somewhere within the Moathouse. You haven’t mentioned the curse to the others… they might think you are a liability! The hardest part of having to be near the Halfling is that you have very difficult personalities. The Halfling is quiet, you are loud. The Halfling beats around the bush, you are direct. The Halfling likes green, you like blue… etc., etc., etc. You and the Hill Dwarf Fighter adventured together. The dwarf hired you, in fact. Shame about the others, but a life of adventure isn’t without risks, and you accept that. The dwarf seems hung up on how the others died… the trap you failed to detect didn’t help… but you think less about that and how the evil priest that captured the two of you placed an evil hex on you. The two of you now have to remain within 50 feet or you start bleeding. Nasty, and it hurts a bit (1 HP/round). The evil priest was named Lareth the Beautiful… pretty vain guy, and a priest of Lloth the spider queen. If the sage you found is to be trusted, all you have to do is find the goblets the priest used for the curse. Mix in some of your blood with the dwarf’s, drink it, and you will be all back to normal. The sage divined that the goblets are in the Moathouse, so this should be pretty simple! You haven’t mentioned the curse to the others… it would probably freak them out! You are a happy-go-lucky guy, but you get the sense the dwarf fighter is mad at you… maybe he blames you for all of this. He’s pretty uptight, and you two are pretty difficult. He’s loud when you are quiet, he lacks subtlety and is too direct, he likes blue and you like green, etc., etc., etc. You have high hopes for the Moathouse. You like collecting trophies, and you would bet your furry feat that there are some strange beasts in that old Moathouse. Maybe you could mount a troll’s head above a favorite seat at the Welcome Wench inn, or sever a mummy’s finger. Maybe a genie’s bottle? You sure love interesting stuff… like this silver brooch with the little mirror inside. The outside says “for Maude”. You can’t remember where you ‘found’ it, but finders keepers! Fiasco Companion, or the bundle of Fiasco and the Companion together. The Dungeon Delve, free fantasy-themed playset for children. 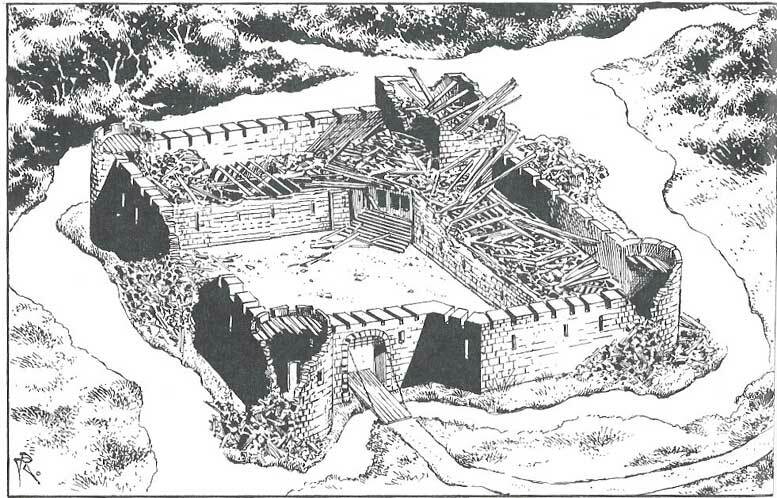 This entry was posted on October 17, 2015 by Alphastream and tagged 5E, AD&D, Backstory, Character Building, Conversions, Greyhawk, RPG History.